I’m offering up my Route 66-inspired “Happy Birthday” banner in two options – one with dots, and one without, depending upon your preference. I printed Kate’s HBD banner on white cardstock and cut out each letter along the outer edge of the black outline. I used my HBD Banner Background template to trace a larger Route 66 outline onto blue cardstock, and then adhered the letters to the cardstock. Lastly, I punched a hole in each upper corner of the blue background and tied the banner together using ribbon. I’ve updated these files to be used for any child and any cars-themed party! The VIP Pit Passes document is two pages – the first page is for your party guests and can be printed out (I recommend white cardstock) as often as needed – you simply write each guest’s name on the blank line. The second page of the document contains specialty VIP Pit Passes – one for “The Birthday Girl!” one for “The Birthday Boy!” one for your “Pit Crew” (any special helpers you’d like to recognize for the day) and two for the “Crew Chief” (your party hosts/hostesses). Once you print your pages, cut them just inside the black line and insert them into vertical name badge holders (size 4″x3″). Clip on a Cars-themed lanyard or badge clip and you’re all set! My Pit Pass Sign completes your party pass table! These are basic blank food labels which you can print out, cut out, and write on with whatever food titles you’d like. 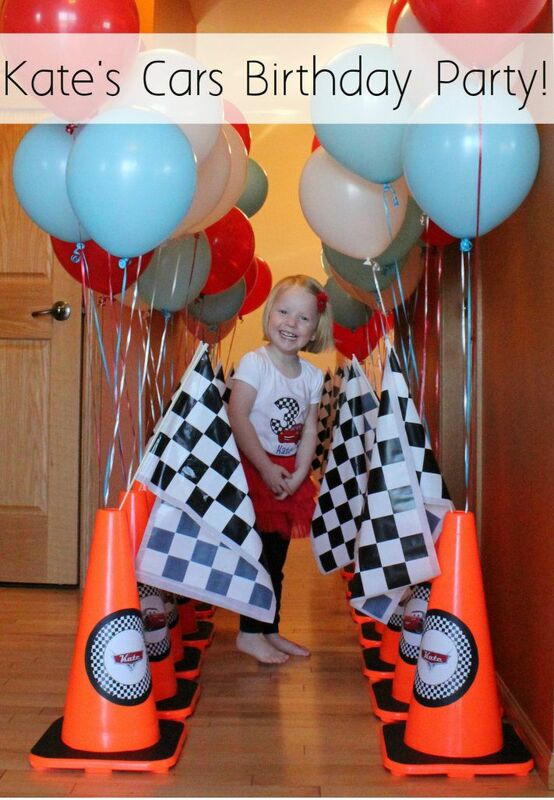 Add your child’s favorite race car stickers to the top of them for some personalized party fun! When you’ve got a bunch of preschoolers running around, some kind of washing station is a must! You can recreate mine using my Car Wash Sign (printed on white cardstock) and matching Hand Sanitizer & Checkered Wraps. To use the checkered wraps, simply print them out on white paper – I used regular paper for this (versus cardstock) so they would wrap more easily – and wrap them around your bottle of hand sanitizer and secure with double-stick tape. I hope these free Cars birthday party printables help make your little one’s party a huge hit! These free party printables are for personal use only. Please credit All Things G&D and link back to this post if you use them. Thank you! Interested in seeing more of Kate’s Cars Themed Birthday Party? Click on the images below! Thank you very much for these free printables. I think, if I can, I would convert these PDF files to JPEG so I could add Lightning McQueen’s image on the VIP Pit Passes, and other printables using Microsoft Publisher. I just hope it is possible to do this in Publisher and edit the text as well to personalized it before printing. If not possible, I guess I have to make it myself, I will just copy your design. Nonetheless, thank you so much for the inspiration and the generosity of letting us use your design and ideas. Pdf’s can easily be saved as jpgs if you have Adobe writer on your computer! Hi Dusty, I would like to ask if it is possible to ask for a copy of the HBD Route 66 Background that is editable? I would also like to make Heath is 1 (just like Kate is 3 banner above), and also I am planning to make a banner of his pictures from newborn to 12 months. At first, my idea is a rectangle size with checkered balck and white border and I will past the picture in the middle and make it a banner. But upon seeing this Route 66, I think this so much better. I’ll just put a checkered black and white background through publisher before I print it then I’ll paste the pictures and hang it as a banner as well. I tried converting the PDF to Microsoft word, so I don’t have to bother you. It was converted but not editable. I was not able to type Heath is 1, or put a checkered background. If this is not possible, I will understand. Thanks in advance. can you tell me what the font is that you used for the banners?? Thanks!! Hi Katie – the font is Britannic Bold. The logo at the top, you mean? I purchased it from Etsy. Check out The Making of Kate’s Cars Party for more information on how I did things and my shopping list. Thank you SO much for sharing these, my son’s 3rd birthday party is in 2 weeks and is Cars themed, so this is perfect timing! I’m so happy to hear it, Kristin! Good luck with your son’s party! Thank you so much for the printables. Can you tell me how you put Kate and 3 in the Cars Logo? Hi Dusty- Thanks for posting these. We are doing a Cars party for my little guy’s 3rd birthday in September because he is obsessed with Cars! I plan to shamelessly steal most of your ideas! I can’t wait to see his little face light up when he walks in to his party! Love your blog- I’m a Madison girl who lives in Indiana now so its nice to see Badger Red and references to Madison in your posts from time to time! This is amazing. Thank you for sharing your ideas and printables!! My pleasure, Cami – thank you so much for taking the time to drop me a line! Thank you so much for the printables! I love the pit passes! Too cute! Hi! Could you tell me where you had her shirt printed?? I love it for my sons 3rd Birthday!! Hi! Thank you very much for sharing these ideas with everyone. I was searching the internet for a while now for free cars printables & was so glad when I came across your website. These are so cute!! I am trying to change a couple of things and am having a hard time trying to figure it out. My son is having a 3rd birthday party this weekend and it is Cars themed. I am wondering how I can change some of the letters on the dot pennants for the letters of his name. The other thing I am wondering about is how to change the name on the Pit Pass? Thanks so much! Hi Dusty! I love your banner and signs!! It is so creative. I am not very tech savvy, please tell me how I can incorporate my son’s name in the banner format. He is going to love it!!! These are GREAT! Thank you so much! My husband and I both work over 40 hours a week and we have a now 3 year old and an infant. Planning my son’s 3rd birthday has been so taxing! I love all of your ideas and thank you so much for offering your printables! One question – is it possible to get the red dot banner printable without the letters so I can do my son’s name along with the “Happy Birthday”? Again, thank you SO much. Hi Keisha! I’m so sorry, but my old computer crashed and these files were corrupted so I am unable to edit them. My apologies! You can do a search on Etsy to see if you can find something similar that you’d like. Good luck! Wow!!!! Thank you, these are adorable, and soooo generous. Our 4th Race Car birthday party today is going to be awesome with these sweet touches. Major credit on my pin and fb, etc. Gracias! Thank you so much, you are so sweet! Hope your little one’s birthday party was a fun time! Thank you so much, Songya – I’m so glad you like them. Unfortunately, my computer crashed a while ago and all of my files were corrupted so I cannot recreate any of this. You may be able to pull images from online. As for changing the letters in the HBD banner, my best suggestion would be to find a program that can edit PDFs, white out the existing letters and add the letters you’d like. I hope that helps! Good luck! Hey do I actually access the printables? I clicked on where u typed them out at and nothing happened. And am I able to edit them to say elijahs 2nd birthday etc..
Hi Rachel, if you click on the links in the post (toward the top) a pdf document will open that you can print out. It is a PDF so the only way you could edit it to add your son’s name is if you have a program that can edit PDFs (like Photoshop, for example). Good luck to you with your son’s party! Awesome. Thank you so much for sharing Dusty. I’m doing a Planes birthday theme for the boys this year, so I can use some of the cards and photoshop the planes logo instead of Cars. Where did you get the little metal card holders? So happy to hear it, Sharon! I found those little place card holders on Amazon. Good luck with your Planes party – I’m sure it will be a hit! Thank you so much for sharing your awesome ideas!! I love the Banner (without dots) and I wanted to add my sons name, but I don’t see any blank ones to use. Do you happen to have that doc you could share? I’ll be sure to mention you when I post pics of our cars party!! Where did you purchase the Cars Lanyards? Omg thank you SO much for all these cool printables. Am planning my hubbies 40th birthday party and this will help me out making his party rock!!! That was very impressive & great party planning. Thank you so much for the free printable. My sons 4th bday is this weekend & I am going to use this material. Hi Dusty . Thanks for sharing these wonderful ideas . Our son’s birthday is fast approaching and we already planned it in the cinema as well . His birthday theme is Cars as well . Your ideas will really help us prepare for his birthday . Bless you and your family . Thank you so much, Jane! I’m so happy to hear you found our Cars Birthday Party ideas helpful. Good luck to you with your son’s party – I’m sure it will be a hit! Hi! What a great party!! I was wondering if you could tell me where you purchased the graphics from, so i could create personalized pit passes for my son? Thanks! Thank you so much, Cory! I purchased the logo graphic from Etsy, but unfortunately the vendor is no longer active on Etsy. Try a site search and hopefully you will be able to find something similar. Good luck! I absolutely love all theses ideas.. We are actually doing it for a communion party.. I want to print him a banner however it isn’t a birthday party.. I needed it to say Lucas’ Communion.. Do you know How I can do this in photoshop from the banner that you have here for download? Thank you so so much again, ,this is AWESOME!! You should be able to open the pdf in Photoshop and then add a text layer over it to add the letters you’d like to use. Good luck Kristin – sounds like a fun party! These are absolutely darling and PERFECT for my sons 4th birthday party this year! Thank you for posting them! My pleasure, Malena! Happy birthday to your little guy – I’m sure his party will be a blast! Wow! Thanks for such wonderful ideas. My girl is obsessed with cars and I am planning her 3rd birthday party. This was huge help. Thank you. My pleasure, Kalpana! Happy birthday to your little girl! My pleasure! Happy birthday to your little boy!